After aircraft are withdrawn from service and when not sold to another country most end up at a scrap yard. However some escape and are preserved at air bases serving as gate guard or are on display in a museum. 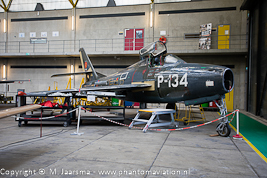 Other aircraft remain in use as instructional airframe at air bases. In Hoofddorp a ROC (Regionaal Opleidingen Centrum - Regional Training Center) is located which offers several MBO (Middelbaar Beroeps Onderwijs - secondary vocational education) courses. The MBO College Airport is specialized in aviation offering various specific aviation training courses (First Engineer Aircraft maintenance, Safety & Craftsmanship Avionics, Aircraft maintenance technician Avionica, Aircraft maintenance technician Mechanics) aimed at providing a career in either civilian or military aviation. 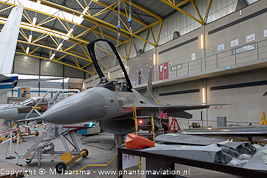 Military related MBO College Airport is part of VeVa (Veiligheid & Vakmanschap - Security & Craftsmanship) were students meet the Royal Netherlands Navy, Army or Air Force and receive training and an internship at a at one of these armed forces (ship, barracks, air base). In addition to classrooms, the MBO College Airport also owns an aircraft hangar which houses several former civilian and military aircraft. These are used for training the students on several aircraft types consisting of fighter aircraft, helicopters and transport aircraft. Five of these are former military aircraft, three fighter and two helicopters, in use for the above mentioned specific courses. J-236 F-16A 312 squadron markings (tail right), 306 squadron markings (tail left). P-134 F-84F 314 squadron markings. D-8259 F-104G 323 squadron markings (tail right). 80+56 BO-105M Ex German Army. 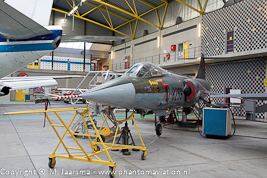 F-16: replaced first the F-104G Starfighter and later the NF-5 Freedom Fighter in Royal Netherlands Air Force service of which 213 were purchased. Of these 139 were upgraded to the current F-16AM/BM variant. In 2019 the RNLAF will receive eight F-35A Lightning IIs starting the replacement of the current fleet of F-16s in service. 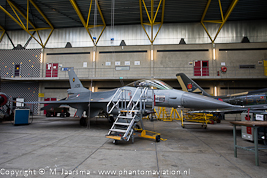 More information: Netherlands, RNLAF F-35s. BO-105M: Operated by the German Army who fielded two versions of the Messerschmitt-Bölkow-Blohm BO-105. The Bo-105M was used as light transport and surveillance helicopter and the BO-105P later (PAH) used as anti tank helicopter. GPLV: Groep Lichte Vliegtuigen - Light Aircraft Group. 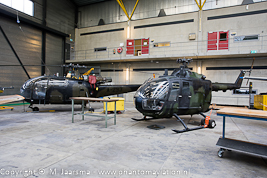 Based at Deelen and Soesterberg Air Bases with 77 Alouette IIIs in use. 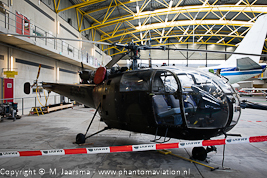 Four of these were dedicated SAR helicopters based at Leeuwarden. The others were used in several roles including transport of the royal family.